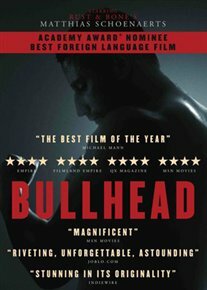 BULLHEAD/RUNDSKOP (15) 2011 BELGIUM ROSKAM, MICHAEL R.
A hormone-addicted cattle farmer becomes drawn into the murky world of Belgium’s illegal beef trade in this award-winning noir-ish debut from director Michael R. Roskam. Haunted by a disturbing incident from his past, Flemish farmer Jacky Vanmarsenille (Matthias Schoenaerts) is addicted to the illegal hormones he regularly feeds to his cattle. Bull-like in appearance, his unpredictable, violent presence soon comes to the attention of mobsters involved in what is known locally as the ‘hormone mafia’. But after being coerced into dealing with a shady meat trader, Jacky’s life spirals out of control as the murder of a policeman and the re-appearance of a woman from his past conspire to threaten his future.